SUVs ARE ONE of the most popular segments in Ireland and that trend looks set to continue for a few more years yet. So, if you want a piece of the action and are looking to buy the into the trend we’ve rounded up five SUVs that are available on DoneDeal, from the dream car to the (slightly more) affordable. The Range Rover Evoque model is a seriously trendy car. It offers decent space for rear passengers and has a very useful 575-litre boot. Whilst mounting a kerb outside a school might be the nearest thing it sees to off-roading, there is a tonne of equipment fitted to the Evoque in case you ever do need to venture off the tarmac. 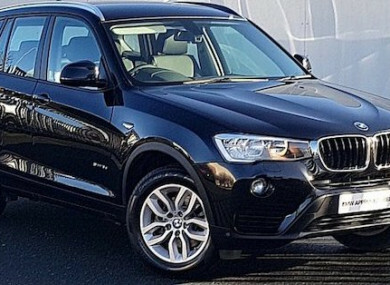 BMW’s new X3 is a family SUV that’s stylish inside and out. It offers plenty of practicality as well as decent driving dynamics and immaculate build quality. This particular model is the sDrive 18d and is powered by a 2.0-litre diesel engine mated to a slick eight-speed automatic gearbox. The Volkswagen Tiguan is an impressive SUV. It has classy looks and a roomy cabin with a good driving position and decent visibility all round. The Tiguan offers a comfortable ride making this perfect for long distance motorway journeys. The Kia Sportage is a great family-friendly SUV thanks to its reasonably spacious cabin, roomy boot and great crash-test safety scores. It has a nice high driving position and feels very sturdy out on the road. It is a great option for the school run. If you are looking for more of a small, compact SUV, the Hyundai Kona is new to the market and features some bold styling that will really make you stand out from the crowd. This particular model is powered by a 1.0-litre petrol engine and is mated to a manual gearbox. Email “5 super-slick SUVs for a range of budgets”. Feedback on “5 super-slick SUVs for a range of budgets”.